We’ve gone over New England’s first six draft positions enough that it feels like we’ve been sent to Store 24 to play the lottery: 17, 28, 33, 60, 74, 92. With final selections in place, we now know that the Pats pick at 125 (fourth round), 159 (fifth) and 193 (sixth). Time for our first Perfect Pats Mock. These aren’t necessarily the players that we think Bill Belichick will select (those can be found in a previous column); rather, these are the players we want him to pick. 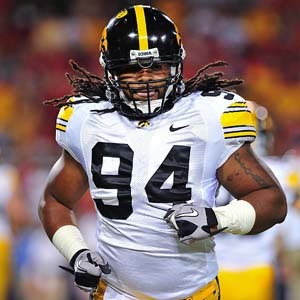 17 – Pass rusher: Adrian Clayborn, Iowa. We took a long look at Ryan Kerrigan (who may or may not make it past Carolina at 16), but we like Clayborn for his heft (6-3, 281) and explosiveness (7.08 seconds in his pro-day 3-cone). Watch his highlight reel – more like a “focus reel,” actually – of Clayborn vs. Wisconsin’s Gabe Carimi. While the All-American tackle walls off Clayborn effectively in the first few plays, the pass-rusher demonstrates his burst during a strip-sack. That ability to get to the QB against fierce competition puts this Hawkeye on our wish list. It doesn’t hurt that a) Iowa coach Kirk Ferentz has worked with Belichick; and b) the Patriots worked out Clayborn this month. 28 – Defensive End: Muhammad Wilkerson, Temple. Good size (6-4, 310) and strength (27 bench reps) bring Wilkerson to the top of our DE list at this point of the draft. While we’ve lauded the work of Cameron Heyward of Ohio State, Wilkerson played tackle in a four-man front before switching to a 3-4 defensive end his senior year. His frame and experience point to versatility that Heyward may lack. With the top defensive needs addressed (you’re welcome), time to turn to the other side of the ball. 33 – Offensive Lineman: Derek Sherrod, Mississippi State. Lots to like about Mr. Sherrod, especially his size (6-5, 320) and experience (first-team All-SEC). Sherrod helped the Bulldogs lead the conference in rushing and started 34 games in his college career. Carimi will be long gone by pick 33, but Sherrod could contribute this coming season. 60 – Wide receiver: Edmund Gates, Abilene Christian. You may want to mock Division II Abilene Christian (Go Wildcats! ), but do so knowing that Bears receiver Johnny Knox went there. Gates had similar speed (a 4.35 40 compared to Knox’s 4.29). New England’s receiver group reminds me of a bees in a box: they can move quickly, but they don’t go very far. Defenses counteract that quickness by flooding the short zones with personnel. One burner can force opponents to re-think their strategy. Gates might be that one. A nickname I just gave him, mind you. And a catchy one at that. 92 – Cornerback: Buster Skrine, Tennessee-Chattanooga. Because his name sounds like “screen,” we can look forward to plenty of pun-filled headlines with the 5-10, 195-pound phantom. (“Skrine Pass.” There. It’s done.) His 40 time (4.37) and 3-cone drill (6.44) have put lots of eyes on the Southern Conference star. Special teams prowess only adds to his luster, as seen on his highlight reel. Coach Belichick worked him out last week after Patriots Daily had mentioned Skrine in a previous column. I tell ya, it’s great to see the influence PD has on the ol’ coach. Right? 125 – Offensive Lineman: Zach Hurd, UConn. Hurd and his linemates get credit for the production of Husky running back Jordan Todman this past season. A unanimous All-Big East choice, the 6-7, 316-pound Hurd could add depth to the Pats’ interior offensive line. 159 – Linebacker: Mike Mohamed, California. A noted scholar-athlete, Mohamed has the size (6-3, 240), speed (4.65 40) and brains (them Cal folks is smart) to play inside or outside behind a 3-4 defensive line. Add his surprising athleticism showcased at the combine(6.70 in the 3-cone drill) and Mohamed gets our vote to take the field at Gillette as a special teamer next season. Portis’ attorney called his action a “mistake.” To me, a mistake is when I put the cereal in the fridge and the milk in the cupboard. Nope: this felony puts Portis off our list. Instead, we continue with defense and select Corbin Bryant, defensive end out of Northwestern. Bryant has had a great spring, including an attention-getting pro day workout that should get him on an NFL club. At 6-3, 297 pounds, Bryant ran the 40 in 5.1 seconds and benched 225 pounds 31 times. This past year he showed playmaking abilities with eight tackles for loss, an interception and forced fumble. So, dear readers, there we go: the Perfect Pats Mock. Sure, Coach Belichick may choose to ignore these picks, but he does so at his own peril. Next Next post: Felger A Cross-Dressing Fascist? i disagree with the thought that no Alambama or Florida player will be picked in the coming draft. Also a top gaurd is coming out of Fresno State. Ken, I go into every year thinking the Pats will draft a Bama or Florida guy and I’m usually proven wrong (at least about which particular guys get picked). As far as your second statement, the last time someone told me the Pats were going to draft a top guard out of Fresno State, I made a big deal of correcting him (oops! ), so I won’t make the same mistake twice.